Inventory We are a resale marketplace, not a box office or venue. Ticket prices may exceed face value. This site is not owned by Cellairis Amphitheatre . Cellairis Amphitheatre Lakewood, formerely the Aaron's Amphitheatre in Atlanta, Georgia has changed names multiple times since it's opening in 1989. The Cellairis Amphitheatre box office provides access to 7,000 covered seats and an additional 12,000 lawn seats. Cellairis Amphitheatre has received much praise for the high quality acoustics of the venue. Bands like Dave Matthews,and Linkin Park have named it one of their favorite venues to play. 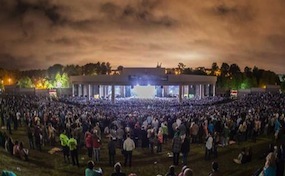 Cellairis Amphitheater tickets are generally reserved for the most popular summer concerts in the Atlanta area. The outdoor amphitheater is only four miles south of downtown Atlanta, located in the Lakewood Fairgrounds. Locals refer to this area as "OTB" and can be a very quick or a very long 4 mile drive. Many artists frequent the venue and even claim it to be one of their favorite facilities to play at. The acoustics are superb even with the low level roof, giving it an enclosed feeling for artists. AmphitheatreLakewood.com is not affiliated with any primary box office or official inventory suppliers. We are a privately owned and operated company that specializes in online sales in the secondary market. Our tickets may be above or below face value and all come with our 125% authenticity guarantee. To order all Cellairis Amphitheatre at Lakewood events simply call our operators or follow the steps online to complete your order.